It has been nearly a year since I last posted, and what a year it has been.. but I digress. Still tinkering with my radio scanners when I get the chance and over the last few days have been satellite hunting. The ARISSat-1 amateur radio experiment was manually deployed on 3rd August 2011 from the International Space Station during EVA 29. Following on from the earlier SuitSat experiment ARISSat-1 was designed, developed and tested by AMSAT-NA and ARISS volunteers. It’s primary mission is STEM (Science, Technology, Engineering, Mathematics) education around the world. The idea of the satellite is students should be able to easily receive the 2m FM transmissions as it fly around the globe and use the information in classroom exercises. The transmissions consist of voice message, SSTV images, telemetry and CW beacons. Certificates will also be issued for SSTV image reception, voice and telemetry reception, CW reception, full SSB telemetry packet reception and Kursk experiment reception. The satellite has four cameras on board that will constantly be taking pictures and sending them to earth using SSTV Robot-36 format in the 2m FM transmission. The official Web site for the ARISSat-1 project is arissat1.org . Well I decided I would have a go and using my Realistic PRO-2006 scanner and my homebrew wideband antenna up in the loft have spent the last few evenings trying to pick up the transmissions as it heads over the UK. 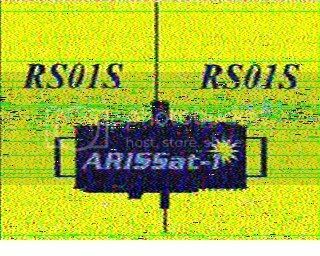 The best reception so far was on the 21st August during the second pass of the evening where I got a decent amount of voice transmission and was able to decode a frame of SSTV (pictured above). I put the audio up on to soundcloud.com as well as youtube. Unfortunately the satellite has suffered some problems with it’s on board battery and goes silent/resets when it enters the shadow of the earth, which is problematic for reception in Europe as the current passes are occurring late evening. This entry was posted in arissat-1, ham, radio, radio ham, scanning. Bookmark the permalink. ← The stress of dog ownership!